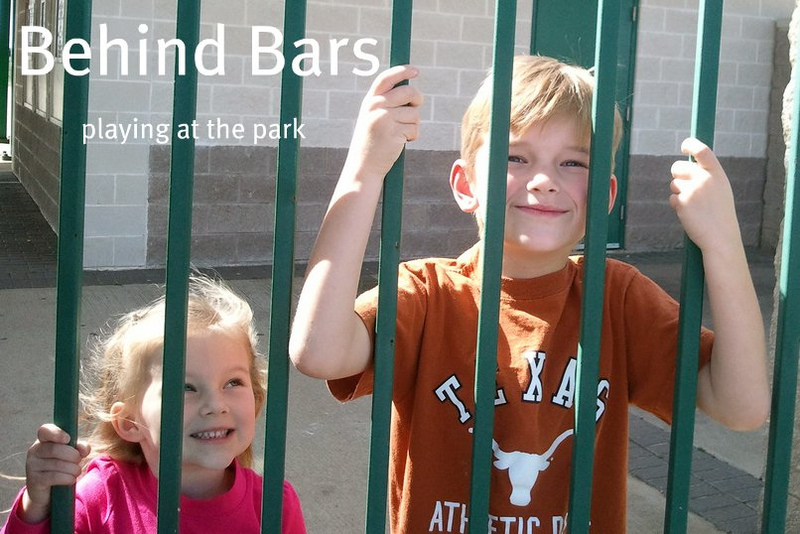 I didn't ever write about our trip to San Antonio the weekend after Thanksgiving, so I wanted to get that recorded. It was absolutely wonderful down there! We will definitely be going down again, when we can manage it. The riverwalk was so beautiful. Donald and Stella and Ben ended up coming with us, and Stella said that it was prettier than the waterways in Venice. We arrived Friday evening, and took a stroll down to the water. It was all lit up for Christmas, since it was the weekend after Thanksgiving. So pretty! We found a diner kind of place to eat that had taxidermied animal heads all over, and I mean ALL OVER the walls. It was crazy. The food wasn’t terrific, but it was a fun place. Saturday we spent the morning at the Alamo. It was really interesting to see - a lot smaller than I expected, and not much is actually left of the original structure. I learned a lot that I didn’t know before, which was neat. The rest of the morning and afternoon we walked up and down the riverwalk. We were all ready for a rest by then (the kids were real troopers the whole time - we were all impressed with them), so we headed back to the hotel to rest a bit. That evening, we were planning on taking a boat ride, but Dave was having pain from his kidney stone, and was pretty achy and sore. Chris had also not been feeling too great, and it was chilly in the evening, so we just went and got a late dinner and called it a night. That’s definitely something I would like to try next time we’re down there. The other thing we didn’t get a chance to do while we were there was Sea World. It wasn’t in our budget this time, but we’d really like to take the kids at some point. Chris was only 8 months old when we were in San Diego, so neither of them have really been, and I think they would both really enjoy something like that. Sunday morning, we drove past the temple on the way out, and then headed home. I really had a great time down there. We will really have to try and find a time when we can meet up there sometime. February was a fun month for us. Dave passed his kidney stone - yay! 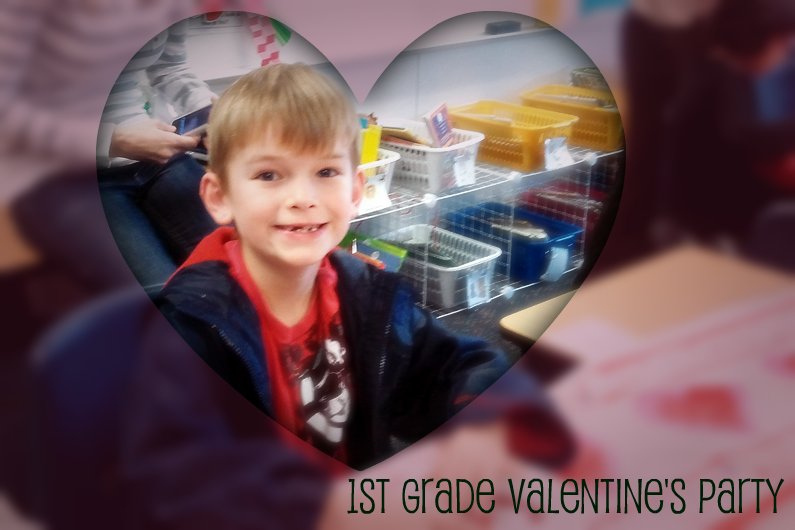 !, Chris had a music program at school, the weather warmed up, and both kids had Valentine’s parties at school. 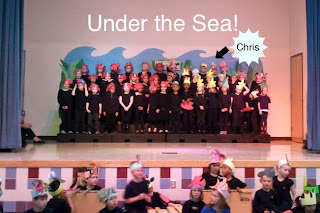 Chris’s program was called Under The Sea, and Chris was a jellyfish. 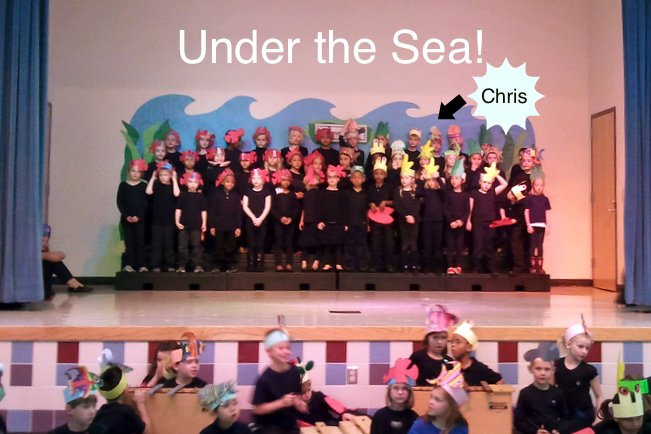 Each different group of undersea creatures got to get down off the bleachers at different points in the program to “swim” around. It was pretty cute. 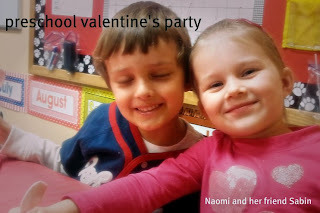 Naomi had a fun Valentine’s party at preschool, with cookie decorating, handing out Valentines, a craft and a game. I didn’t get to stay for the whole thing because I am a room mom for Chris’s class, and I had to go do his party. 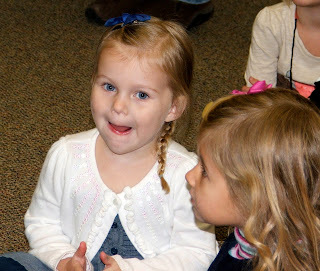 Naomi got to go home with a friend after preschool, so she was just fine with me heading out early. She’s quite social, that one! 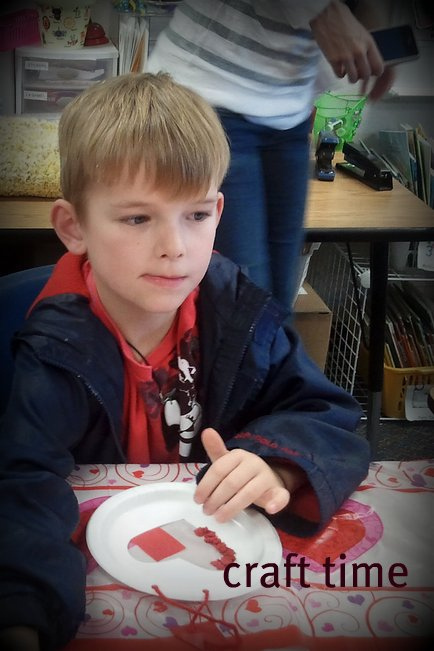 At Chris’s party, we had a craft, snack/treat, and an activity planned. They had exchanged Valentines earlier in the day. 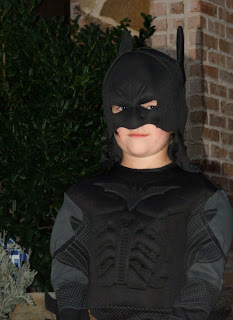 There isn’t as much time for parties at his school, so it was just the right amount of things to do. They both came home with quite the haul of suckers and such, which is what they enjoyed the most, I think. 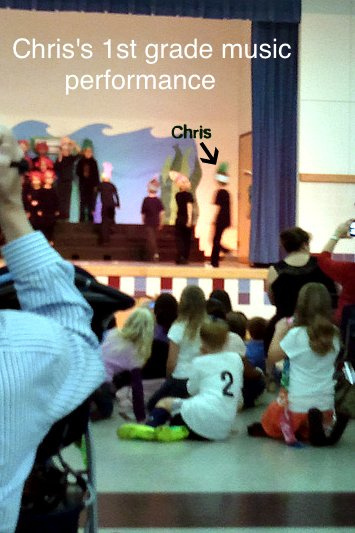 Chris had the chance to give his first talk in Primary, the last Sunday in November of 2010. 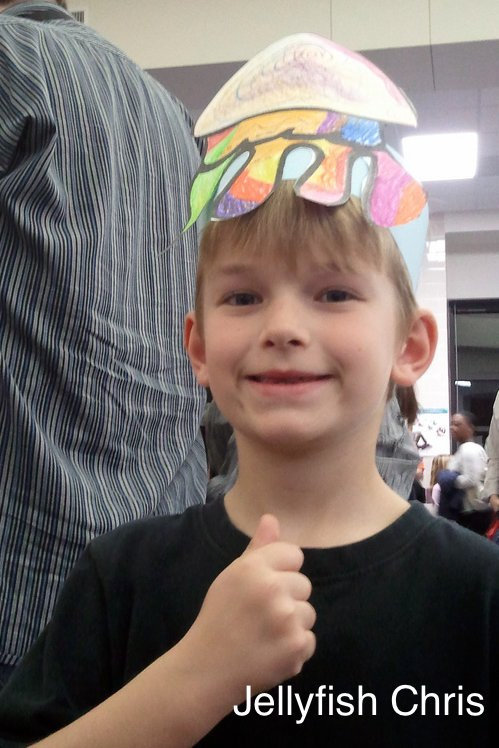 He did really well – spoke clearly, looked at everyone, and smiled. We were proud of him. He even wrote it himself. It was about service, and what we can do to serve. He gave a few examples of ways we could serve others, and bore his testimony about service. I should have taken a picture of him, but I forgot. He also was able to give a talk while my family was here visiting, which was a lot of fun to be able to have them here for that. His topic was "The Scriptures teach of Jesus Christ and His Second Coming". I love that he gets the chance to do things like this from the church! Christmas cookies, a photo by sarahlw2383 on Flickr. 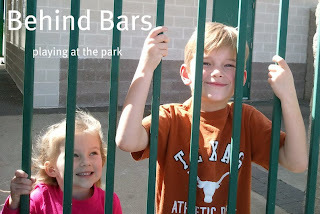 One of my goals for 2012 is to spend some time here, on this poor, neglected blog of mine. Please excuse me while I do a bit of catch-up in the midst of the current posts. We had a wonderful Christmas this year. My parents, brother, and sister came to visit (missed you, Jeff!) for Dave's graduation from his Master's program (yay!). Then we had a quiet Christmas break, and a wonderful Christmas day. 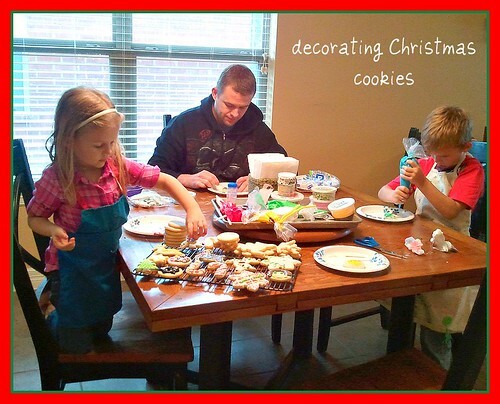 Somewhere in there, we decorated some cookies. Hope you all had a very merry Christmas! 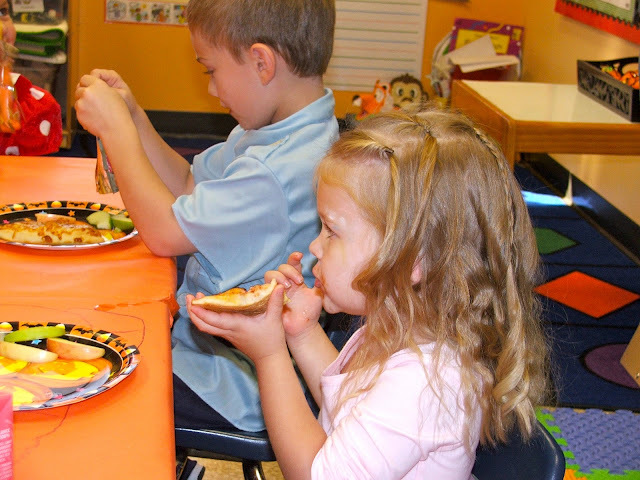 Naomi had a Thanksgiving “feast” at preschool; there was white bread, green beans, sliced cheese, turkey lunchmeat, and applesauce. Pretty funny, but the kids loved it. 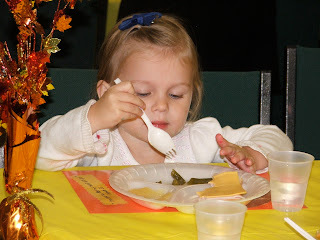 Naomi even asked for more green beans! She made a pilgrim hat, and looked adorable in it. 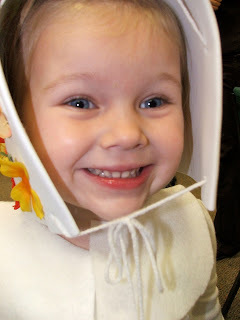 Some of the teachers put on a puppet show about the pilgrims, and the kids thought it was a riot; they laughed the whole way through. Chris also got to have a “feast” in kindergarten, but they asked the parents not to come for that. They had three classes in one room, and I guess there wasn’t space for any more people. It was one where everyone brought something to share. He said he had a lot of fun. katie (and me too, i guess - mostly katie, though!) started a photography business! 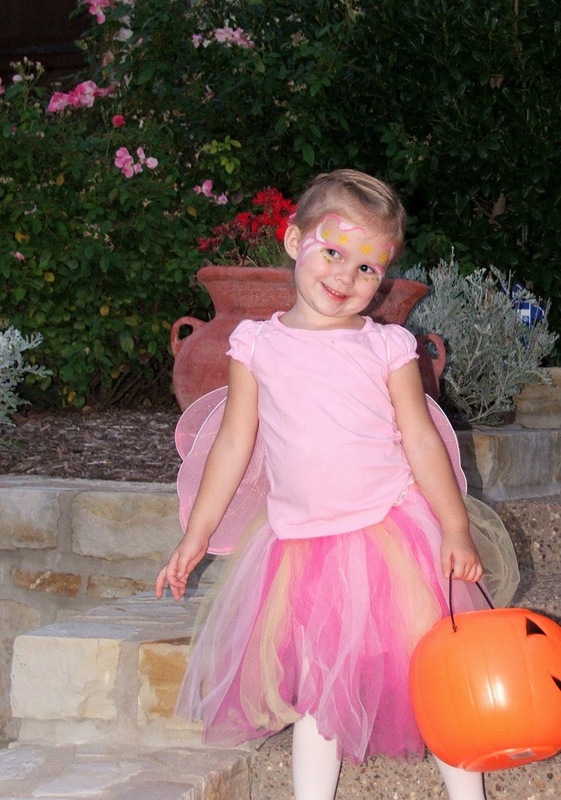 here's the link to the website: www.katiewillsonphotography.com. She's been taking our family pictures for a few years now, and i love the way these turned out! the ones with the sun flare are my favorite, i think. i totally slacked on the christmas cards this year, so no one's really seen these yet. consider this our family wishing yours a (late!) happy holidays! 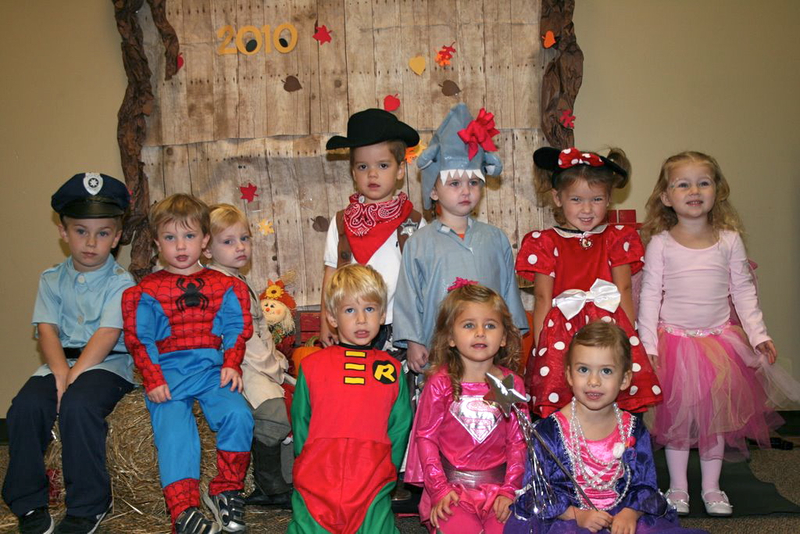 Friday, the 29th, our ward had a trunk-or-treat party. They went a little crazy, and had three bounce houses, food (chicken salad sandwiches, corn dogs, chips, cookies, and hot chocolate), games, and prizes. We had a great time! We’re really feeling like part of the ward, and that we know most everyone. 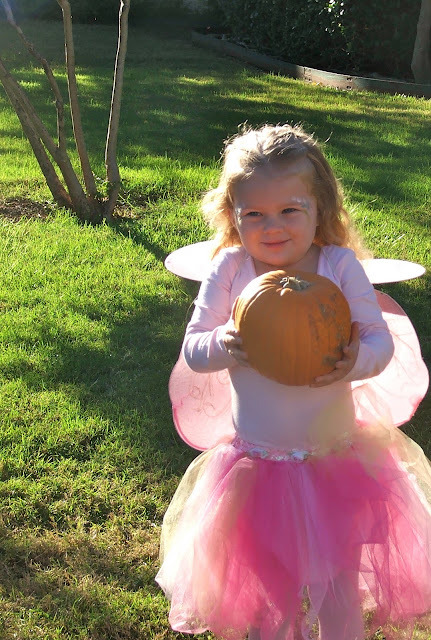 On Halloween, we took the kids to a few houses around Jonathan and Katie’s house. 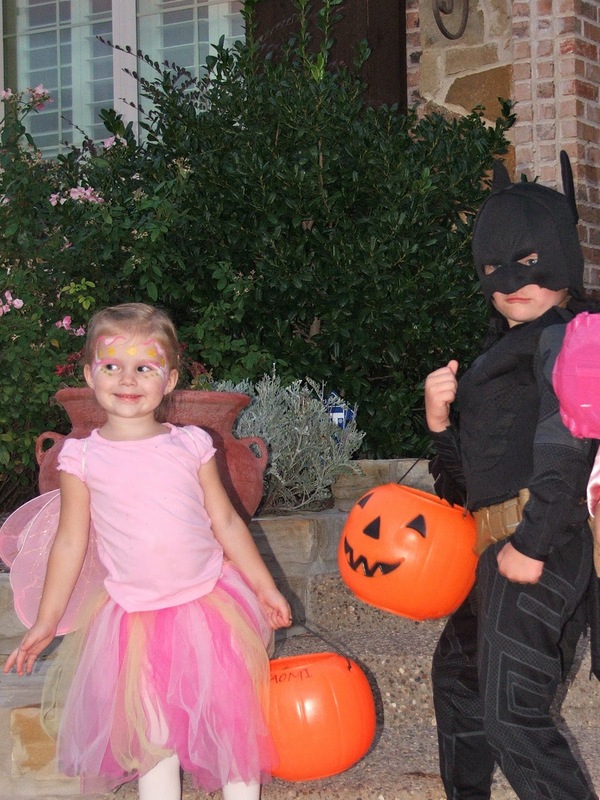 It was a big family affair, and a fun way to do it. 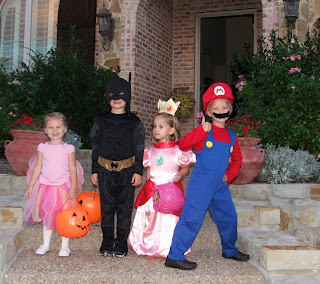 Chris was Batman, Naomi a fairy, Jacob was Mario, and Lily was Princess Peach. At the end of October, Naomi had a fall festival at preschool. 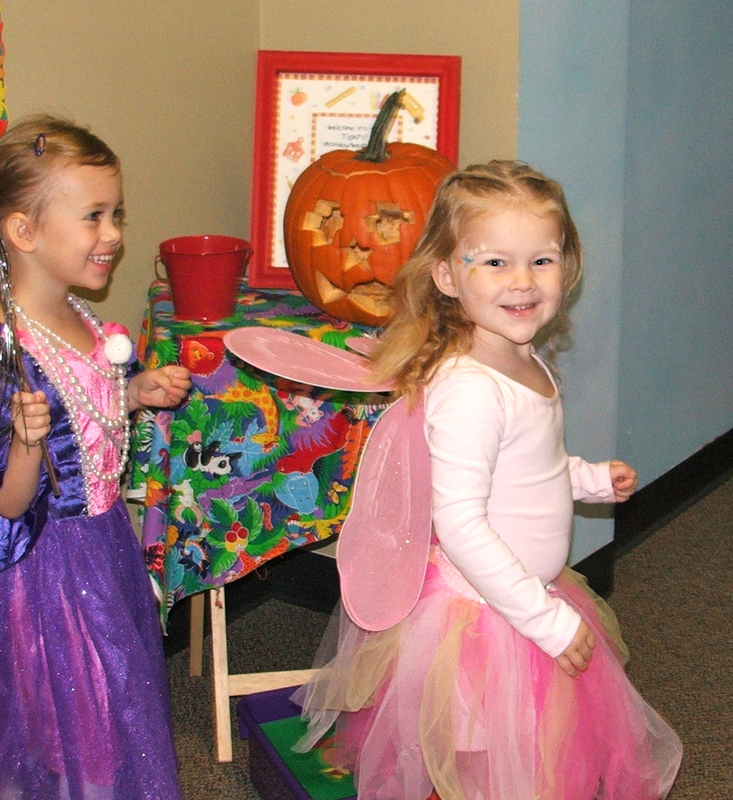 She got to dress up in her costume (a fairy), and have lots of fun stations. 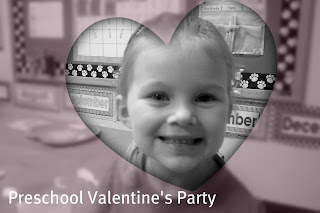 After all their morning fun, another mom and I put on a class party for them. Everyone takes a turn planning a party, and I figured it would be nice to get it done at the beginning of the year. We had pizza, played a few games, decorated cookies, and made fall wreaths. Best Way to Organize Your Kitchen Pantry. Happy 4th Birthday Wesley boy! How Often Should I Clean My Outdoor Grill? So what do you do.. In a medium saucepan, bring 1 1/2 cups water to a boil. Add rice and stir. Reduce heat, cover and simmer for 20 minutes. In another saucepan, combine 1 1/2 cups cooked rice, 1 1/2 cups milk, sugar and salt. Cook over medium heat until thick and creamy, 15 to 20 minutes. Stir in remaining 1/2 cup milk, beaten egg and raisins. Cook 2 minutes more, stirring constantly. Remove from heat, and stir in butter and vanilla. Serve warm.